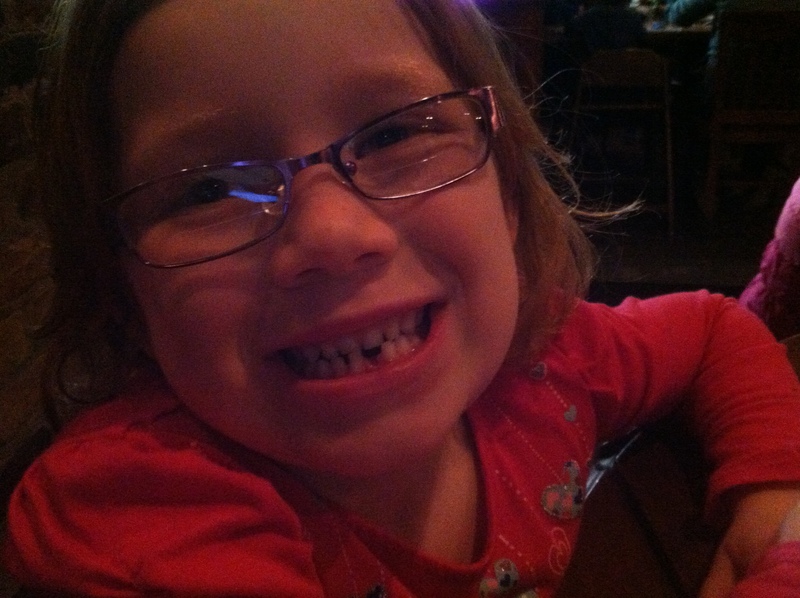 Extra, extra – she lost her first tooth. While I don’t have the prop, I’m borrowing her full-throttle, complete disclosure attitude for today’s post. A year ago today Sparrow Migrations went up for sale on Amazon in Kindle and paperback (also available in select stores!) One of the great things about the self-publishing community is the trend toward disclosure. From launch-day to-do lists to sales figures, it’s probably out there. For me, the big asterisk is that self-publishing is dominated by genre authors: mystery, science fiction/fantasy and romance, and series authors. As a non-genre author of a single novel, much of the available information isn’t directly relevant to me. So I’m offering up my experience as a self-pubbed literary author, emphasizing what worked and what didn’t in terms of promotion and marketing. Postcards aimed at readers – Have something to hand potential readers you encounter. It’s not complicated. Cover art on one side, boiled-down back cover copy, event and where to buy info. Pre-launch, I got 1,000 postcards from a local printer for $156. Those helped get customers in the stores for events, and reminded those who couldn’t make it that the the book existed. For me, e-book = Kindle. I’m no longer enrolled in KDP Select and eventually I hope to get onto other platforms, but for this first year I stuck with the 800-pound gorilla mostly so I could do their giveaways. The modern-day needle in a haystack. Giveaway I: June 4-9, 2013: 5,446 downloads. June sales: 60. Amazon reviews increased from 16 to 39. Average rating 4.6/5 stars. Giveaway II: Jan. 14-18, 2014: 33,642 downloads. Jan sales: 44. Feb. sales: 41. To date in March: 10. Reviews increased from 39 to 148. Average rating remains 4.6. Noticeable bump in Goodreads “want to read” numbers as well. Among other free book sites, I listed both giveaways on FreeBooksy. I just was on the site and it looks like they may have changed the terms to not free for authors. When I did it, it was free, though they have to pick your book, so it’s not guaranteed. For other free listing sites, check out the tool on Author Marketing Club that lists 20-plus. For the January giveaway (which was timed to the fifth anniversary of the Miracle on the Hudson, the real-life starting incident of the novel), I advertised on BookBub. It cost me $110. I was ecstatic at the 33,600 downloads, thinking my paid sale spike would be proportionate to that which followed the June giveaway (which was not timed to coincide with anything), meaning ~330 books sold in the next month. Sadly, it wasn’t. But the $2.09/book royalty I receive more than covered my costs, and so far, it appears that giveaway has a longer tail, making BookBub worth it for me. NOTE: You can advertise non-free books on BookBub, but the rates are much higher. So when I went back to paid I tried…. So far in 2014 I’ve sold 101 Kindle copies, compared to 149 for the nine and a half months Sparrow was available in 2013. The needle’s moving in the right direction, anyway. Goodreads giveaway – In July I gave away ten hard copies and spent $100+ for books and postage. One key mistake was opening the giveaway to Canadian readers. Each book + postage to the four Canadian recipients cost me more than the $14.95 retail cost of the book. If I’d limited it to U.S., I’d rank the success higher. Some 781 people entered the giveaway, which helped my “want to read” numbers. Only four of the recipients have provided a review, which is encouraged by the site. They could still come through, though, and I believe Goodreads membership overlaps well with my target reader. Hence the jury’s still out. Library database subscription – I paid $29 for this but haven’t used it. Libraries are nice customers for self-pubbed authors because they don’t demand the same discounts or returns that bookstores do. So I may yet get around to using this. But it’s an important lesson to plan before you spend either time or money. Plover Pilgrimage – Knowing how series authors dominate self publishing success stories, I contrived a second book by excerpting four chapters into their own self-contained story. It works for both adults and readers as young as middle grade, so I added illustrations. I love the book, the cover and the illustrations. The artist generously gave me the originals and they’ll look beautiful framed on my office wall someday. But the book’s not done anything sales-wise, and constituted 11 percent of expenses. Lesson learned. Trade journal print advertising – Aimed at bookstores, which, as mentioned, are set up to put unknown self-pubbed authors at a disadvantage. Hand-carry your books into the stores you know yourself and skip advertising in PW Select. Out-of-town bookstore signings – Without any community recognition to provide marketing oomph, my three-store experiment leads me to conclude it’s a waste of time and gas. Not having a mailing list sign up on my Kindle file prior to the BookBub giveaway. What I wouldn’t give to be able to reach those 33,600 readers directly! Not all would have signed up, of course, but even 1 percent would be 336 people to contact when my next book’s ready. Hope this helps another author. What experiments have you found success or steered away from? Cari, this is great. I have to hand it to you for your honesty. I believe a lot of people think writers have money to spare when, really, we have stuck our necks out to produce something we think others might need or enjoy. As a local history writer, I have concluded my work is a public service more than anything else. I did manage to pay my kids’ orthodontist with my first book. I still want to buy one of yours. I was out of town when you came to Northport. Maybe I could connect with you sometime when I’m in T.C., which is often. Best to you! Glad you found it helpful, Kathleen! Thank you so much for your frank, helpful post Cari. I am self-publishing my first book after a successful legacy book. The advice from the self-publishing community is invaluable and inspiring. Your book sounds fantastic, so you have a new reader. You’re welcome, Nichole. Best of luck to you. I’ve been through many of the same experiences, trying out different advertising, giveaways and reduced price promotions. I found that the best results came from the reduced price promotion on Ereader (over 300 sold), BookBub (2,800) and Kindle Nation (200) where I reduced the price from $2.99 to $.99. I’ve found the sales continuing at 3-5 a day after. These have also led to many nice reviews. My first recommendation is to join Association of Independent Authors and use their resources for recommendations on book award programs. My book Across the Mekong River won four 2013 awards, which made a huge difference in my promotions and sales. Paid advertising in a number of different venues did virtually nothing for me. Thanks for those ideas, Elaine. Also good to hear those high download numbers for BookBub reduced price promotion. I’m considering that in the future.